DrinkWire is Liquor.com’s showcase for the best articles, recipes and reviews from the web’s top writers and bloggers. 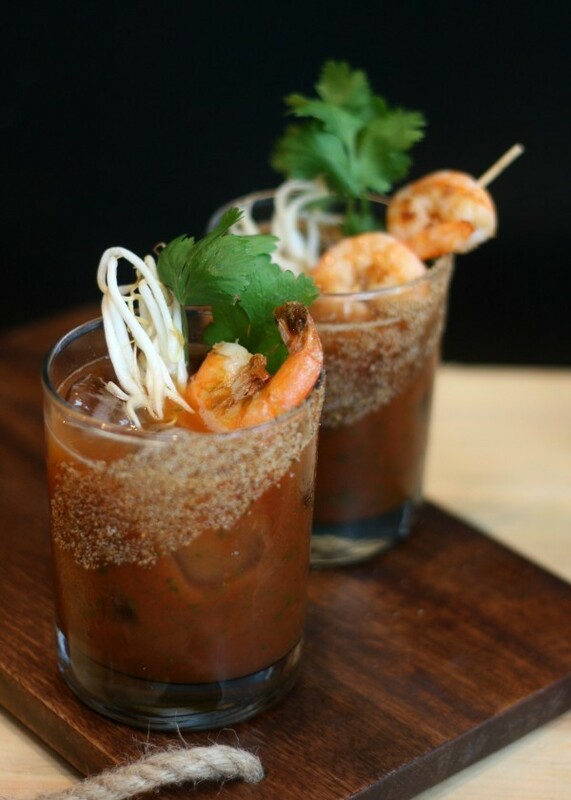 In this post, Garnish offers a thai twist on a Bloody Mary. 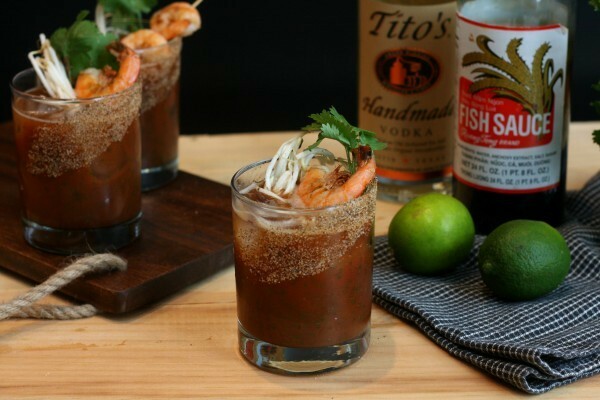 Bloody Mary lovers, let me introduce you to a new ingredient: fish sauce. Fish sauce, a staple of Thai cuisine, is not so named because it's meant to be used on fish, but rather because it's made from fish. Fish that is mixed with salt and allowed to ferment, then squeezed to extract all of the liquid that the salt leeches out of it. Fish sauce is basically rotted fish juice. And that's kind of what it tastes and smells like. And I want you to put it in your drink. I know. But stay with me here. The thing is, you've probably already had fish sauce and really liked it. It's a major ingredient in the sauce that goes on Pad Thai, which is why I had a bottle in my pantry to begin with. For something so absolutely terrible on its own, fish sauce can be an incredibly delicious addition to a recipe. When its intense taste is mixed with other ingredients, it provides a uniquely savory flavor that can really amp up dishes when used appropriately. I was using it to make a sauce for some grilled fish when it occurred to me that it would be absolutely awesome in a Bloody Mary. 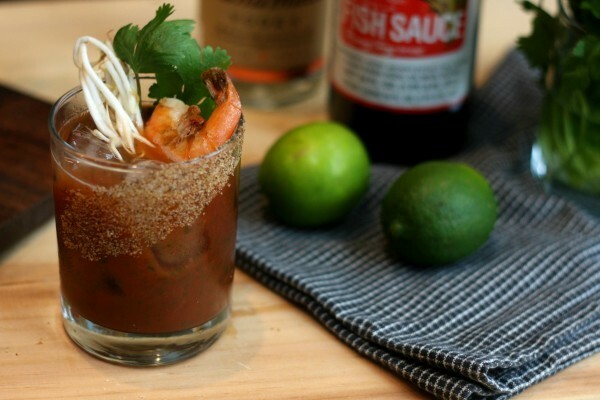 Thus the Thai Bloody Mary was born. Taking inspiration from the sauce I made for our Thai-style grilled fish, I flavored the tomato juice with cilantro, serrano pepper, lime juice, and fish sauce. Add some vodka and you've got a darn good Bloody Mary. It's savory, tangy, and absolutely delicious. And of course the best part about a Bloody Mary is the garnish. I finished these with cilantro, pickled bean sprouts, shrimp, and a brush of Cajun seasoning. The bean sprouts in particular are pretty fabulous, and the shrimp taste amazing dipped in the cocktail. You've seriously got to try one of these - your brunch will never be the same! Combine tomato juice, lime juice, fish sauce, cilantro, and serrano pepper in a food processor and blend until the cilantro and pepper are pureed into tiny pieces. The mixture may foam a bit; let it settle and then stir it gently to recombine the ingredients. To prepare the glass, take a pastry brush and dip it lightly in lime juice or water. Shaking off the excess, wipe it across the side of a rocks glass and over the rim. Then roll the glass in Cajun seasoning (I used Tony Chachere's). Fill the glass with ice and add the vodka. Pour in the tomato mixture and stir gently. 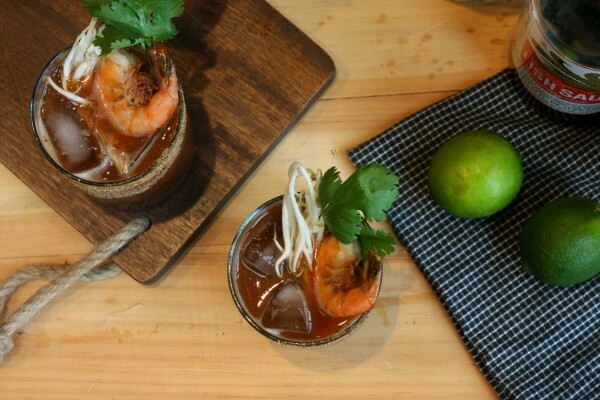 Garnish with fresh cilantro, pickled bean sprouts, and shrimp. *For the bean sprouts, I adapted a recipe for Dua Gia from Girl Cooks World. Combine 1/2 cup white vinegar, 1/2 cup water, 1/4 cup sugar, and 3/4 tsp. salt in a saucepan and simmer until the sugar and salt are dissolved. Let cool completely, then pour over bean sprouts and stir. Let sit for at least an hour. **For the shrimp, I briefly sauteed them in some olive oil with a dash of Tony Chachere's. This can be done in the shells or peeled. This recipe first appeared on Garnish.